Situated in the Bungarribee Precinct of the Western Sydney Parklands, the Blacktown Soccer Park Facility consists of a new amenities building / grandstand, premier field, two additional playing fields, access roads & carparking for 190 vehicles, storm water retention / re-use infrastructure, passive recreation spaces and pedestrian circulation. 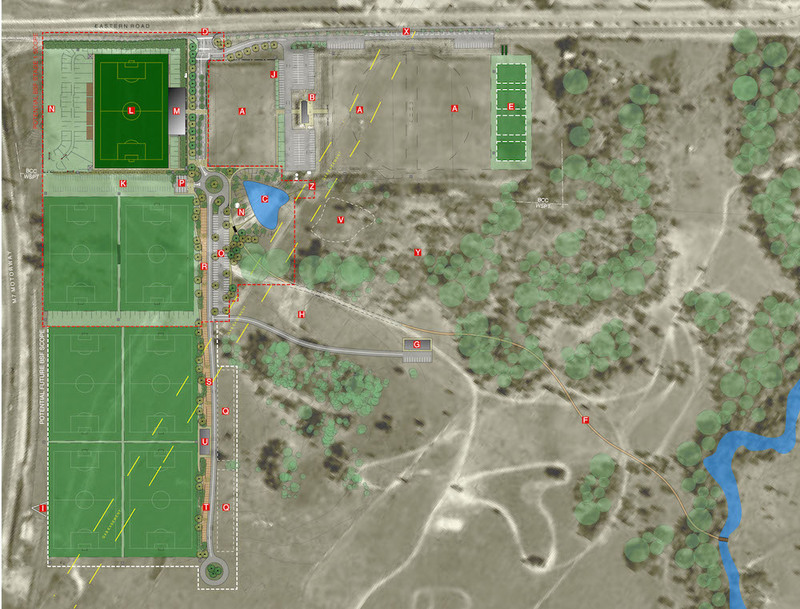 Masterplanning also foreshadowed the extension of this first stage of implementation with additional grassed fields and facilities to the south. Ongoing water restrictions in Sydney meant that irrigation of playing fields from town potable water would be unsustainable in the long-term. A number of alternative water supply options were assessed for feasibility including recycled mains water, sewer mining, ground water extraction / recharge and storm water re-use.